Whew! I made it! It might be a little late, but I'm finally finished writing up everything I saw last year and it feels pretty darn good. With this final batch of films, I will soon post my (very) belated top 10 list, and then it's onward to 2018. At last. I’ve never been crazy about the Guardians characters, so a sequel was always going to be a hard sell for me, but this one did a couple of things that I liked more than the original. First of all, and this will probably be an unpopular opinion, but the songs in this one are much better than the first, in which just about every selection was a 70’s radio hit that had been played in about six other movies. This time James Gunn went for non-single tracks from the likes of Fleetwood Mac, Sam Cooke, Parliament…definitely more my thing. I also liked Baby Groot a lot better than regular Groot- what can I say, the little guy won me over with his opening credits dance. And finally, Michael Rooker’s Yondu plays a bigger role in this one and he has a fairly moving arc in the end- he may well be the only Guardian that I actually like, so that’s an improvement. But overall, I have no real affection for Star Lord, Rocket, Gamora or Drax, so even though this film is more character driven and less formulaic than the first, it’s hard to care that much about Quill’s daddy issues or Gamora’s sister woes. And Kurt Russell’s Ego, the Living Planet is yet another boring, one-note Marvel villain in the end. But the movie does have its moments, particularly in some of the visuals (Yondu and Rocket’s revenge escape scene is pretty awesome, the Ravager fireworks funeral is cool), and if you do like these characters, then the increased focus on familial bonding should work for you. It’s a mixed-negative, but I’m right on the edge with it. This comedy from director Malcolm D. Lee (The Best Man, Barbershop: The Next Cut) is a joyous, energetic romp through New Orleans, kind of a female version of The Hangover, but unlike some all women comedies that seem to be trying too hard just to prove that girls can be as gross as guys, this is a movie that is fully in tune with female sensibilities and friendships (while keeping the raucousness intact). Four college friends, including Queen Latifah, Jada Pinkett-Smith and Tiffany Haddish, reunite for an all expenses paid weekend at the Essence Festival, courtesy of Ryan (Regina Hall) a lifestyle guru who’s out to build her brand with her football player husband (Mike Coulter). The weekend leads to some wild shenanigans of course, and thanks to the easy chemistry of all four women, but especially a breakout performance from a scene-stealing Haddish as the hard partying Dina, it’s a riotous and fun time out with the girls. The winsome cast makes you really believe in the friendships and helps to overcome any cliches in the script. And thank god in this one the message is to get rid of your dead male weight and celebrate singledom, not “you will be unhappy and die alone unless a friendly Irish cop comes to rescue you from spinsterhood” (I still have a chip on my shoulder against Bridesmaids for that). This is an interesting idea for a film, in that it is entirely composed of hand drawn paintings, and the visual effect is breathtaking. However, the visual effect is where nearly all the value lies in this experiment. After Vincent Van Gogh’s suicide in 1891, the subject of one of his paintings, who carries a posthumous letter from Vincent to his deceased brother Theodore, arrives in the French countryside where Vincent spent his last days and attempts to unravel the mystery of his death. This is done through black and white flashbacks (even more stunning images than the whirl of colors in the present day) of recollections provided by those who came into contact with Van Gogh, but Vincent himself is never a true character in the film, seen only in brief asides and from the back. Our main character Armand (Douglas Booth) is both uninteresting and unlikable, and there is no compelling story to shape these lovely images around. The result is a lifeless film which was originally developed as a short and perhaps should have remained so. A passionate, defiant film with all the urgency and righteousness of its main characters. Set in France in the early 90’s, this is about ACT-UP Paris, a branch of the organization started in the U.S. during the AIDS crisis. These young French men and women gather together to discuss ways to actively “disturb the public” in order to cause attention to the epidemic of deaths sweeping the country, and the film’s scenes of the ACT-UP meetings are fierce, angry, and electric in their intensity, feeling so spontaneous as to appear unscripted. This is a movie about how protest movements form, about how activists come together and the emotions and the stakes needed to justify literally fighting for your lives. When these people disrupt meetings of government officials and burst into the offices of the pharmaceutical companies, actively forcing them to listen whether they like it or not, it makes you uncomfortable and apt to pay attention. The AIDS crisis was a terrifying time when young, mostly gay men were dying by the thousands, and this film does not shy away from showing their loves, fears, joys and suffering in all the explicit, life affirming detail that requires. The large ensemble eventually morphs into the tragedy of love lost, as two young men find and lose each other amidst the chaos, and the brutal unfolding of these events is tough to take, but essential to watch. This is drama at its most powerful and effective. 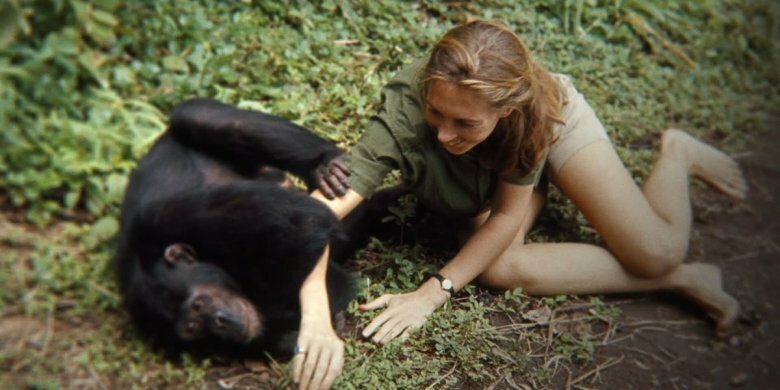 A beautiful tribute to the pioneer who lived with apes in the wild, the then 26-year-old secretary with no degree who was sent to Tanzania on the orders of Dr. Louis Leakey in 1962 and became the near mythical “Jane Goodall,” inspiration to countless women and scientists the world over. This documentary, directed by Brett Morgen, is comprised of recently unearthed video footage of Jane and the apes in the mid-60’s, which was shot by her then husband Hugo van Lawick. The footage is stunning, with intimate portraits of the apes that Jane befriended and named, as they first ran from and then began to trust and communicate with the stranger in their midst. As astonishing as the footage of the animals is, the film is just as much a portrait of Jane herself, narrated by and with occasional tidbits of Morgen interviewing her alone in the present day, reflecting on the early discoveries and journey into the wilds of Africa, which had been her lifelong dream. Jane is a truly inspiring figure, her calmness, patience and passionate belief that her destiny lie with the chimpanzees at what became her institute, shaping what is an extraordinary and moving testimonial to the life’s work one of the world’s greatest icons. Accompanied by a majestic score from composer Philip Glass, every frame of this film is a delight. Why the hell are these people having dinner in the snow? A movie that’s so forgettable you’re likely to forget the title if it wasn’t based on an Agatha Christie novel that has already been filmed many times before. Kenneth Branagh plays Hercule Poirot with one of the most ridiculous mustaches in movie history and something of a god complex (I don’t remember that in the book), as he tries to solve the murder on the train with thirteen suspects all lined up to walk in and out of interviews with him (most of which now oddly take place outside the train). It actually starts off decently enough, with a fast paced sense of humor and some nice period production design. Director Branagh seems to be trying to liven the proceedings up, which is an improvement on the first film (a recent rewatch of the 1974 version reminded me how dull most of it is), but things quickly get out of hand, with escalating and increasingly absurd action sequences taking over for gaps in the screenplay. Seriously, we’ve got gunshots, fistfights, more stabbings, etc. It all gets tiresome and silly, especially when Branagh’s ego takes over as he tries to go for his heavy handed explanation set to cheesy music and closeups highlighting his oh so world weary brilliance. This one’s not worth the time of day. A subdued film about a transgender woman (played by Chilean trans actress Daniela Vega) whose lover dies suddenly, exposing her to the cruel treatment of his estranged family members and suspicious police. While Marina suffers through the indignities of a world that regards her as an other, she struggles with her own grief for the man who loved her the best that she can. This is a subtle character study, but also an accessible film that mostly wants to divulge the inherent dignity of this woman to a broad audience, and director/co-writer Sebastian Lelio accomplishes this by filming a large majority of the movie in closeups of Marina’s face, forcing you to see her in all her humanity. Vega is charismatic and likable, and it’s a sensitive, thoughtful film that earns its keep, even if it could have used perhaps a bit more of a story to accompany its compelling lead character. Rian Johnson (Looper), was given the sole task of writing and directing the latest Star Wars entry, and to his credit it’s not just a rehash of The Empire Strikes Back, which many feared after the The Force Awakens seemed in so many ways to be a retread of the story beats from the original 1978 Star Wars film, constructed give the fans exactly what they wanted. Unfortunately, it’s not a success in its own right either. In fact, it’s kind of a mess. The movie picks up where the last one left off, with Rey (Daisy Ridley) on an island with Luke Skywalker while the rest of the Resistance comes up with a plan to do…something, in order to sort of mimic the structure of Empire, wherein its characters were separated for their own story arcs. But this movie seems designed to stall for time and in so doing becomes a collection of bizarre scenes that don’t tie together into any kind of a coherent storyline. Rey spends a lot of time hanging out with a spurned and angry Luke while occasionally force-skyping with Kylo Ren, who she decides must have some good in him (probably because there really is no explanation or motivation for why he’s so evil), and Finn (John Boyega) is paired with a new character named Rose (Kelly Marie Tran) to go off and hire a codebreaker (Benicio del Toro) to help the rebels disable a tracking device the enemy uses to find them. Oscar Isaac’s Poe Dameron has a bigger role in this film as the captain who’s constantly rebelling agains his own team (for no real reason it turns out), and Laura Dern is brought in as a vice admiral with purple hair. These competing storylines are a jumbled mess of arcs that end up going nowhere, and Finn and Rose’s journey through the heart of a casino planet in particular gave me flashbacks to the prequels (complete with forced and badly delivered jokes). There are flashes of visual creativity from Johnson (the weird red throne room where Snoke sits, the mirror cave Ren goes into), but without a meaningful or logical story to hang it on, moments like this feel random and disjointed. I do appreciate the mass influx of diversity onscreen (it seems like two thirds of the space pilots are now women!) and I admire Johnson’s risk-taking as opposed to JJ Abrams’ playing it safe, but I’d be more interested in what he might come up with when he’s in charge of his own spinoff series and given the freedom to create new ideas and characters from scratch along with a new story entirely, rather than coming in and trying to break free whilst still being constrained by previous films. It’s a blend that produces an oddly unsatisfying concoction. March 21, 2018 by Ariel Shavonne.